Have you ever seen the products that you can buy from Amazon or the big box stores which when applied to a fire can change the color of the flames? They retail for around 10 bucks but don’t last but a few minutes. 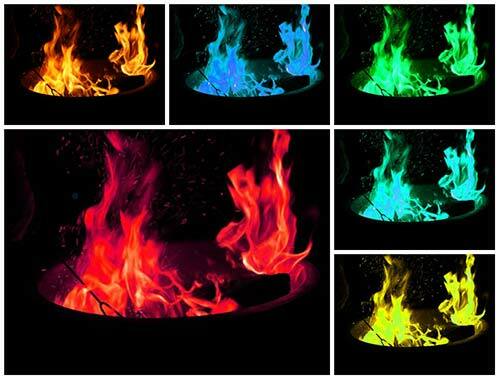 Making your own color fire is easily done at home with stuff you probably already have on hand. Usually you have a lot of these products needed to make the different colors so you can make big batches and keep the color going for longer. DISCLAIMER: This DIY project is meant for the older kids with supervision or as an adult activity. It is important to use rubber gloves when making your own color changing fire logs because some chemicals can burn or irritate the skin. DO NOT COOK OVER THIS FIRE, YOU COULD GET VERY SICK. Stand at least 10 feet away from the flames while you are using the color mixes.